On Friday I changed the display at Woodside Animal Hospital to feature Dahlia! The center is a canvas like last time, but on either side (with the ribbons) are metal prints, a new product I am so excited to offer! They are available in standard sizes or 30 different cutout shapes (displayed are #25 and #29)! Made from recycled aluminum, the image is burned on to the metal – extremely cool! 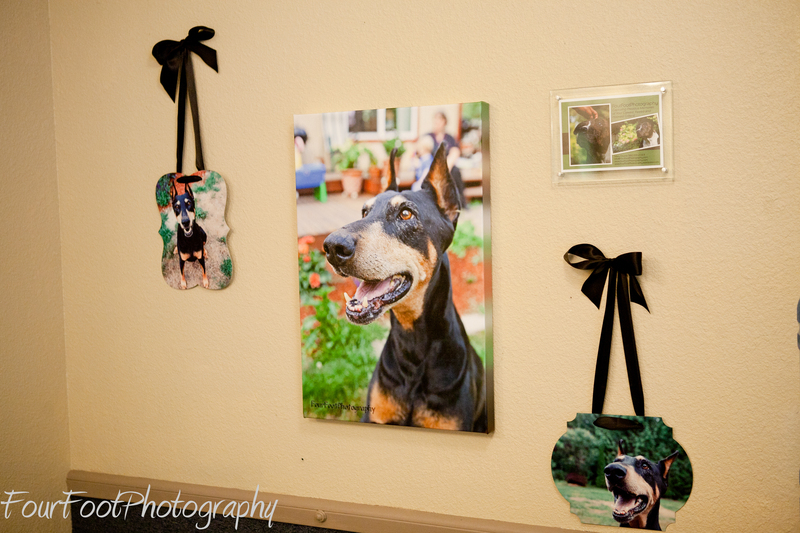 We can custom order images of your pets in the sizes and shapes you choose – I also think they’ll look great with the float wraps for a unique wall display. They can be hung from drilled holes as shown, or we can attach a float mount to the back so the image appears to “float” on the wall. Did I mention I’m SO EXCITED?! I will have information on the website in the next few weeks – it’s not too early to be thinking about Christmas…Stop by Woodside to see them in person! That is so exciting for your customers! Love the metal wall hangings. those might be fun for kid photo gifts for family.